Flat Roof Specialists: We specialize in flat and low-pitch roofs. Flat roofs normally have a bad reputation. 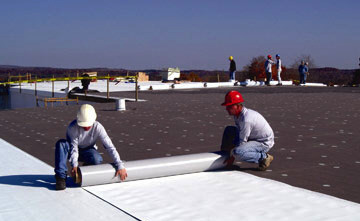 What we use to counter that is a single-ply membrane (PVC/EPDM/TPO), which is the best waterproofing membrane in the industry. When working with us, you can be confident that you will get the best roof available. These systems are suitable for everything from mobile homes to large commercial buildings. Sloped Roofing: We can provide any roof you want. Asphalt, wood, slate, metal, or composite shingles, High Tech Roofing can do it all. Sheet Metal Work: We do all of our metal work in-house. This means, all metal is custom made specifically for your project. We have been doing this for over 38 years. We always ensure quality and let our services speak for themselves. We will beat or meet any legitimate contractor's price. Our main goal is to create a happy and satisfied customer. We offer free quotes and can talk you through the entire process to make sure nothing outside of emergency repairs is rushed; so that you end up with exactly what you want.